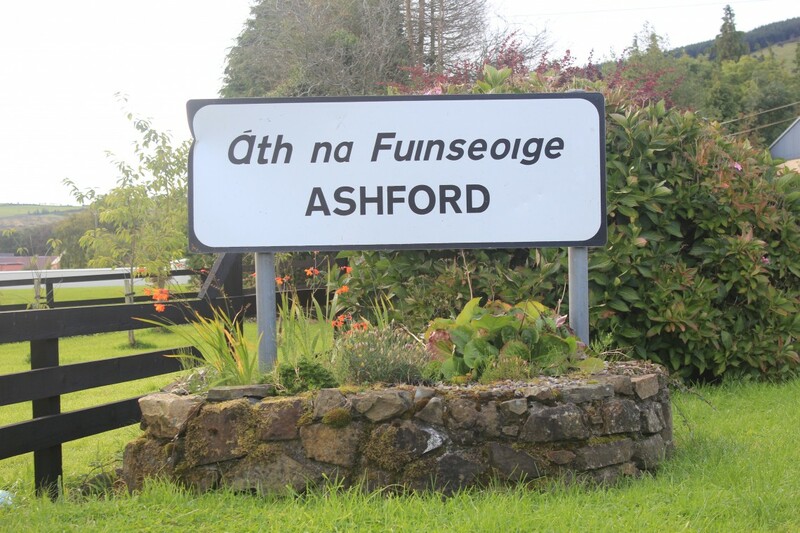 The village of Ashford, (Áth na Fuinseoige) is nestled at the foot of the Mullaghareirk Mountains, (Mullach an Radhairc). The name of the village in Irish means “Bridge of the Ash” and a bridge still exists at the eastern end of the village over the river Sink. Talented stone masons on the local FÁS scheme have created a beautiful stone bridge wall with an engraving of the ash leaf on it. Ashford is part of the legacy of one of its most important historical figures – St. Ita. Ita, or Deirdre as she was named before her introduction to Christianity, originally came from the Déise country of Co. Waterford. 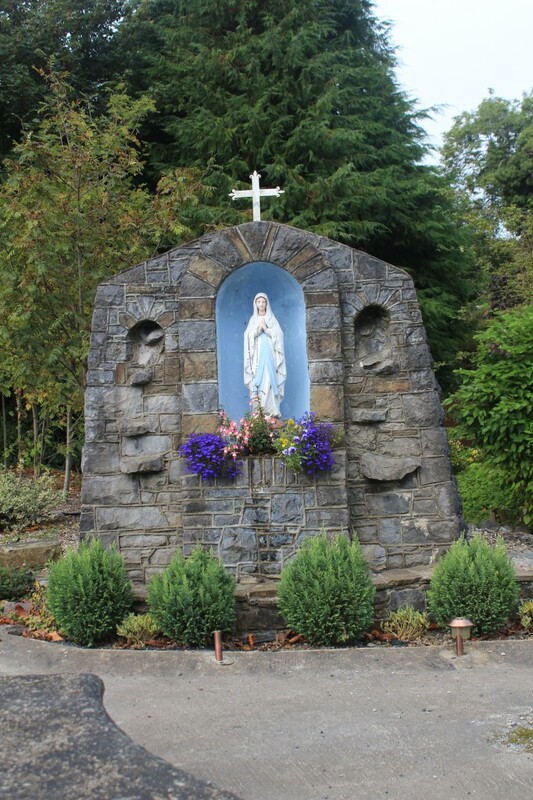 As a young woman she followed God’s calling and settled in this scenic part of West Limerick, in an area then called Cluain Chreadail, which means “meadow of faith”. She obtained some land from a generous local chieftain, upon which she built a Church and famous school. 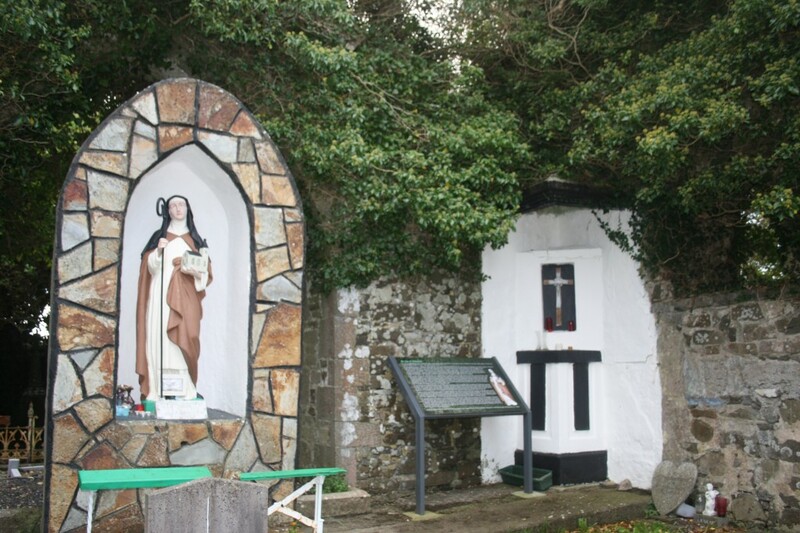 She became known as “Foster Mother to the Saints” and many important saints were educated in Killeedy, most notably St. Brendan the Navigator. 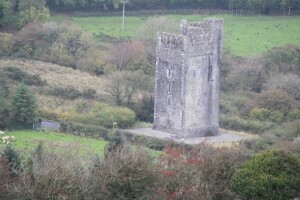 As a mark of the people’s admiration for Ita the name of the area was changed to Cill Íde, (Church of Ita). Her feast day, 15th January is much celebrated on an annual basis. The tradition of education started by Ita has continued to this day with a Montessori school and national school in the village. 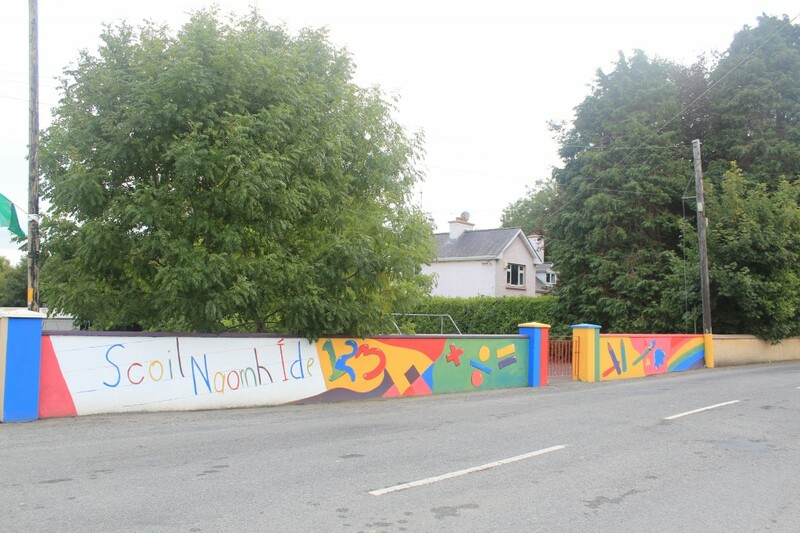 The present national school, Scoil Naomh Íde, has been in existence since 1858 and pupils still attend school in the original building, which has been much modernised to meet the needs of the modern generation. The Montessori school stands on the site of a former R.I.C. barracks, which was burnt during the War of Independence. 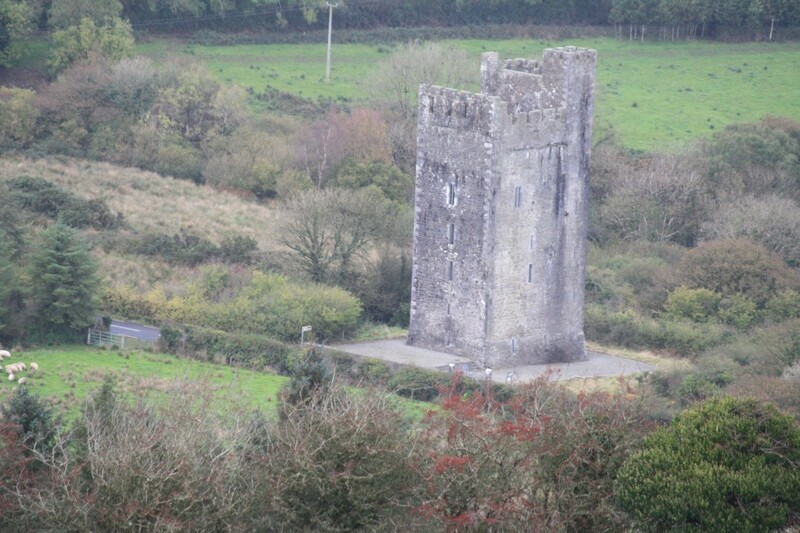 A further imposing landmark on the western side of Ashford, on the road to Abbeyfeale, is Glenquin Castle, built by the O Hallinans in the 11th century. The castle is in excellent structural repair. The village Church, again called after St. Ita, was built in 1835. The roof of the Church was blown off on 6th January 1839 on what has become known as “The Night of the Big Wind” (Oíche na Gaoithe Móire). At one time a Protestant Church existed on the western end of the village. There is no trace of it today. On the hillside a local Mass Rock exists. Isolated rural locations such as the example in Ashford were chosen to hold Catholic religious ceremonies in the 17th and 18th centuries. At the time practicing the Catholic faith and attending Mass was a matter of difficulty and danger due to both Cromwell’s campaign against the Irish, and the Penal Laws of the late 17th and early 18th centuries.Mass is still celebrated annually at the Mass Rock. A plaque was erected as a permanent memorial to those who so valued their faith in times of adversity. There was also a Mass Path in the area called the Cobs Road that was used in the past for people to walk to Mass. Mass goers tied their horses at the top of the path and walked down to the church hence the name of the pathway. The Cobs road forms part of these walking trails today. 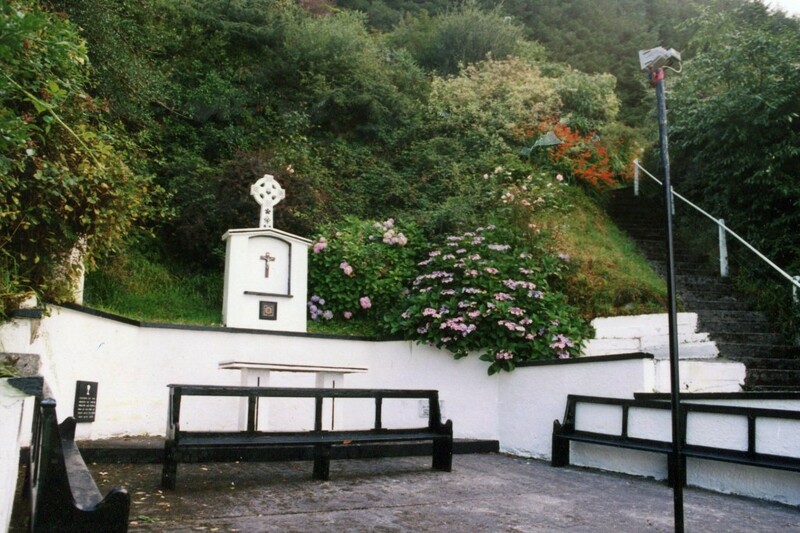 Adjacent to the Mass Rock a cross was erected to commemorate the visit of Pope John Paul II to Ireland in 1979. A temporary creamery was established by the Irish Agricultural Organisation Society at nearby Twomey’s Cross and closed when Kantoher creamery was established in 1904. Kantoher creamery was a major source of income for the parish as an outlet for the primary produce of the parish – milk. A poultry plant operated from Kantoher for a significant period of time until its closure in 2005. The Mullaghareirk mountain range and the forest which forms a scenic backdrop to the village was planted by Coillte in the mid 1950’s, when it provided much needed work for many of the local people. Rowls House, in the middle of the Mullaghareirks, built by Arthur Langford in the second half of the 19th century became the office of the forester. Today many of the original trees have been harvested but the forestry is still an extremely busy place and a haven for many types of flora and fauna. The mountains form a special protection area for the hen harrier, an endangered bird of prey. The mountains have also provided fuel for much of the parish for many years in the form of turf which is harvested annually. As with all towns and villages at the time, there was a broad range of occupations within the population of Ashford. 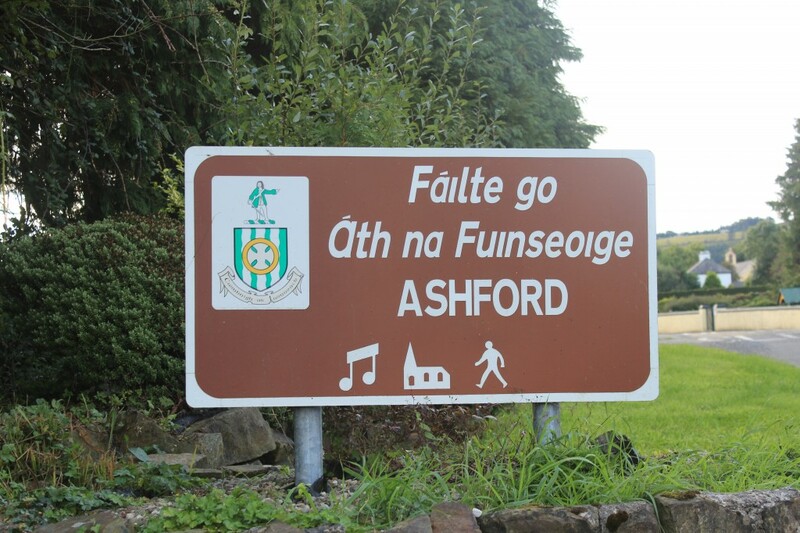 Three of the townlands in the census make up the village of Ashford as we know it today. These are Clooncon, Mauricetown and Gortnaclohy. There was a broad range of craftsmen recorded in the census including a harness maker, a shoe-maker, 3 shop-keepers, 4 national school teachers, a land surveyor, 5 seamstresses, a carpenter, a stonebreaker, 2 coopers, 3 creamery workers, a merchant tailor, a postman and a publican. 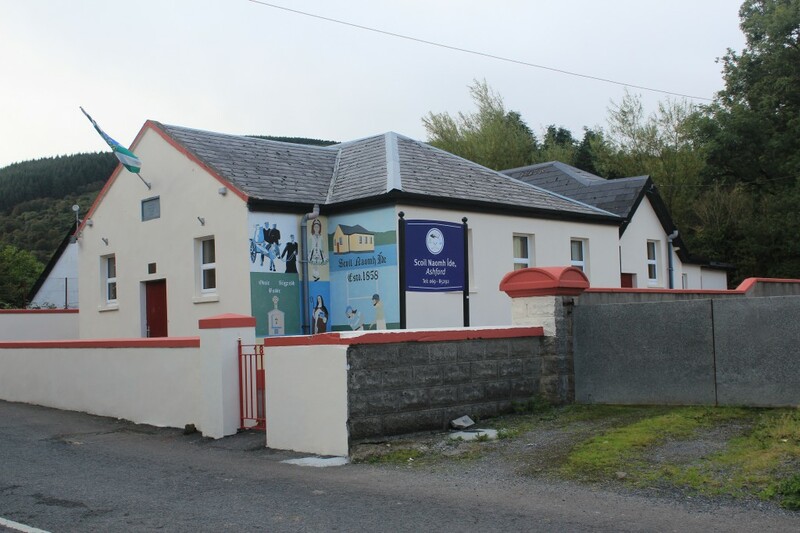 The parish of Killeedy has grown into a thriving community with a number of businesses, voluntary community organisations, traditional music and sports clubs. Limerick to Ashford:Take N21 from Limerick signposted Tralee/ Killarney. Enter Adare. Entering Newcastle West at the first roundabout take 1st exit, at the second roundabout take 2nd exit onto R522 signposted Dromcollogher. After 7km turn right signposted for Broadford. 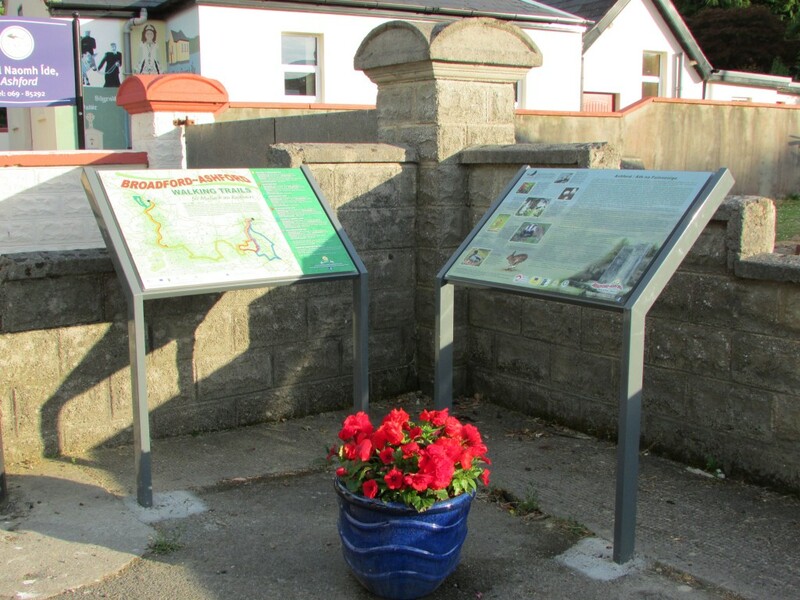 Enter Broadford.Turn right on entering Broadford and go to the end of the village and take the Abbeyfeale road R515. Enter Ashford after 6km.